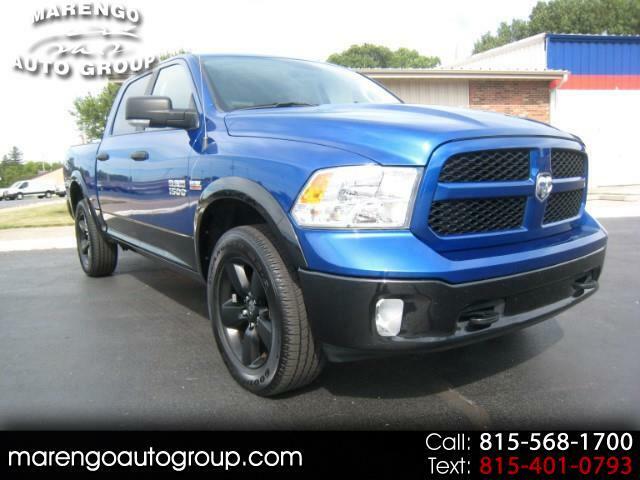 2016 RAM 1500 SLT OUTDOORSMAN 4X4,PRICE JUST REDUCED $1000 5.7L V-8 HEMI,3.92 AXLE RATIO,ORIGINAL MSRP $46,825.00 WELL EQUIPTED WITH: 8.4" UCONNECT TOUCH SCREEN RADIO, BLUE STREAK PEARLCOAT WITH BLACK ON THE BOTTOM AND BLACKED OUT WHEELS, SUPER SHARP LOOKER! BRAND NEW SET OF TIRES! BACK UP CAMERA, ELECTRIC REAR SLIDER, ELECTRIC FOLDING MIRRORS, HEATED SEATS AND HEATED STEERING WHEEL, BED LINER, KEYLESS ENTRY, TRACTION CONTROL,3 UNIVERSAL GARAGE DOOR OPENERS,TOW PACKAGE, TRAILER HITCH, HEATED MIRRORS, POWER SEATS WITH LUMBAR AND SO MUCH MORE. CALL SCOTT OR BRIAN TODAY TO SCHEDULE YOUR TEST DRIVE OR STOP IN ANYTIME.